It is a muddle, a murk and a desperate-looking thing, the president on the subject of the Islamic State. The Islamic State is the junior varsity. No, it is a “cancer.” We will “degrade and destroy” it. No, we’ll render it “a manageable problem.” It’s all so halting, herky-jerky and, for a great power, embarrassing. Ich bin ein Limiter of Spheres of Influence. Mr. Obama has been severely criticized and soon will change the story with a new statement. Actually to a degree he already has, in his joint op-ed piece Thursday with British Prime Minister David Cameron. Our countries “will not be cowed by barbaric killers.” That’s good, not being cowed, but what does it mean and for how long? What is extraordinary in this moment of high, many-fronted peril is that the president’s true views and plans are not only unclear to the world but a mystery to his countrymen. You want to think he is playing a cool, long game, that there’s a plan and he’s acting on it. He’s holding off stark action to force nations in the region to step up to the plate. The comments of the Saudis and the Emiratis are newly burly. Good, they have military power and wealth, let them move for once. He is teaching our Mideast friends the U.S. is not a volunteer fire department that suits up every time you fall asleep on the couch smoking. In the meantime he is coolly watching new alliances form—wasn’t that the Kurds the other day fighting alongside the Iranians? Mr. Obama’s supporters frankly hope that there’s a method to the madness, that he is quietly, behind the scenes and with great subtlety pulling together a coalition that will move. But this is more hope than knowledge, and a coalition would need a leader. You have to wonder if potential coalition members won’t think twice about following such an uncertain trumpet. They have reason to doubt Mr. Obama’s leadership, and it is not all due to his current, contradictory statements. Once again, the Syria “red line” episode shows itself an epochal moment. The president’s decision not to act after Syria used poison gas on its citizens showed other leaders of the world that this president will make a vow—a public yet personally tinged one, of great consequence—and feel free, when the moment reaches crisis levels, not to come through. It wasn’t that he looked dishonest, it was that he looked unserious. With the hard human beings who run the world, that is deadly. People say Mr. Obama hasn’t spoken on the Islamic State with sufficient “passion,” but the world at the moment probably doesn’t need more passion. He needs to speak with clarity, conviction and most of all credibility. Politicians always think they have to reach people’s hearts. They have to reach their minds. Is the administration’s foreign-policy apparatus as rudderless, ad hoc and faux-sophisticated as it looks? Is the president starting to fear, deep down, that maybe he is the junior varsity? Who at this key moment is the president talking to? The world of American foreign-policy professionals is populated by some brilliant and accomplished men and women who’ve been through the wars. Is he seeking their counsel? The problem is really not that the president, as he said, does not yet have a strategy. It is that the world doesn’t know and the country doesn’t know how, deep down, he thinks about the Islamic State. What is its historical meaning and import? Is it something new that requires new thinking? Is it a game-changer in the region? Does it, alone or in league with others, actually threaten the United States? Or are the threats more like bluster as it attracts new members from throughout the world and work to hold the ground it’s seized? What is the president internally committed to doing? Is he dodging a decision or has he made one? What has more than five years of White House experience taught him? All presidents learn on the job, but because he tends to blame others for his woes and, like many of his predecessors, avoids public reflection on his mistakes, we don’t know how events have shaped his thinking. For instance: Deciding against his political nature to be militarily proactive and topple Moammar Gadhafi of Libya in 2011 was, pretty clearly, a mistake. Does he think so? A monstrous little dictator was removed, which left an opening for people who were more monstrous still, who murdered our ambassador, burnt our consulate in Benghazi and have now run us out of Tripoli. What did the president absorb from this that now affects his thinking? Mr. Obama loudly insisted Bashar Assad of Syria must go, then did nothing to help his opponents. Assad was thus turned from an often dangerous and duplicitous adversary to an embittered and enraged formal foe. Was that progress? How does it fit into the current drama? 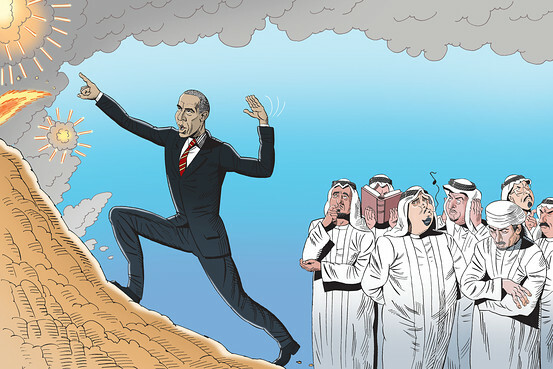 Does Mr. Obama fear that if the U.S. goes after the Islamic State in northern Syria it will strengthen Assad’s position? If so, should it be the most crucial and immediate fear? Isn’t the Islamic State a more dangerous and pressing threat? If it is, can a deal be made with Syria for the U.S. to move militarily for a limited time within the relevant part of that nation? Does Mr. Obama conflate “go back to Iraq” with “move decisively against ISIS through bombing, with limited troops on the ground guiding and gathering intelligence”? Does he believe these are the same thing? If so, why? An overriding question: To what extent will the passage of time erode the U.S.’s ability to move effectively and decisively? Does the chance of effectiveness recede as the days pass? Is the administration working with its eye on the clock? Does Secretary of State John Kerry speak for the president, and is he reflecting the president’s views when he speaks? Mr Kerry has been both strong and resolute in his condemnations of the Islamic State. One wonders, more than ever now, the extent to which he is involved in a bit of freelancing, going forward with relative independence from White House political hands. If he is, good for him. But NBC correspondent Andrea Mitchell wondered this week if the difference in comments between Mr. Kerry, Defense Secretary Chuck Hagel and Joint Chiefs chairman Gen. Martin Dempsey—all of whom have been more informative and more verbally hawkish than Mr. Obama—constituted an internal administration conversation that is now being played out in public. That would be interesting, to say the least, if it’s true. You also have to wonder if Vice President Joe Biden’s remark on the Islamic State—”We will follow them to the gates of hell until they are brought to justice”—was also part of a private conversation gone public. Mr. Biden is irrepressible and likes to say ringing things, but his remark came across to me as a foreign-policy version of his famous 2012 comment that he was “absolutely comfortable” with gay marriage. It was his way of forcing the issue and pushing for an action he thought both advantageous and correct. Three days later, the president announced that he had reached the same conclusion.